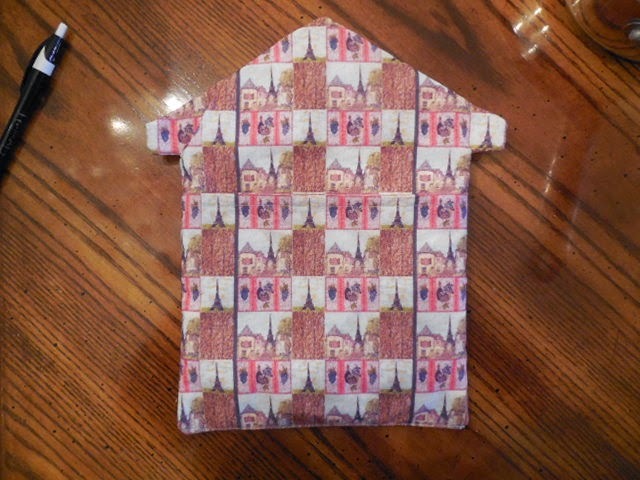 I co-designed the house shaped pot holder with my dad, Bill Hubler, who is a real estate agent with Century 21 Alliance, in Mantua, NJ. 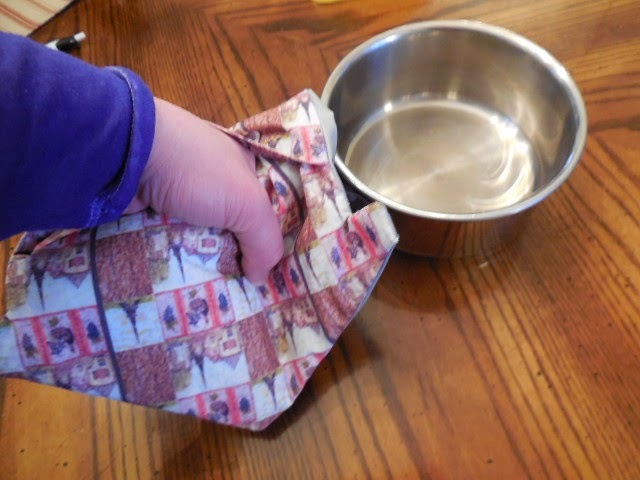 He wanted me to make something for his customers, and give as Christmas / holiday presents. 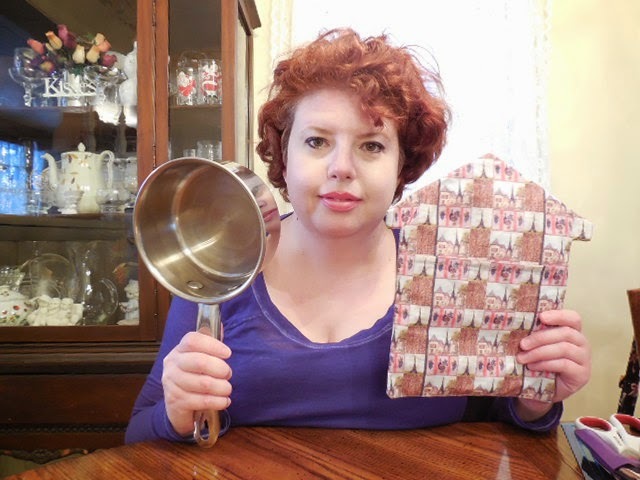 They also are great for housewarming gifts, mortgage brokers, agents to give to their clients, you can give them to someone who moved into their first place, or a new home. 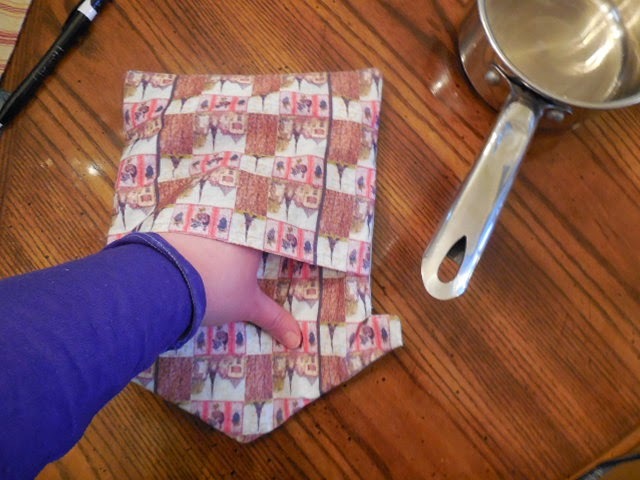 This pot holder has a pocket for the hand – my mother suggested that they’d make great pocket holders for items, to hang them and organize things inside the pockets. 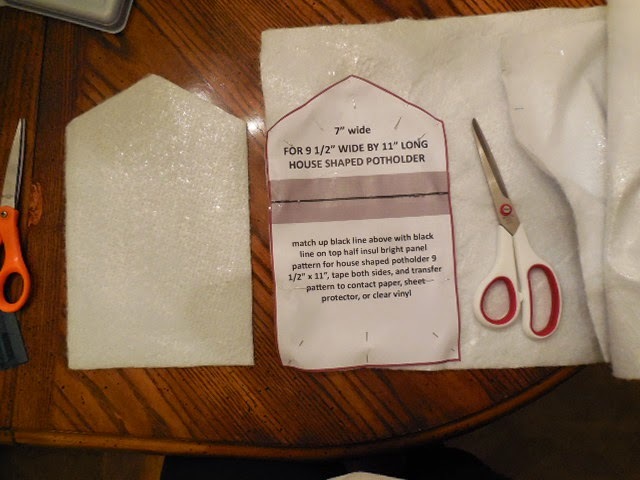 Well, it took me an hour to make it, but I’ve been doing them for a while lol, so maybe for a first timer, it may take you 1 1/2-2 hrs, tops. 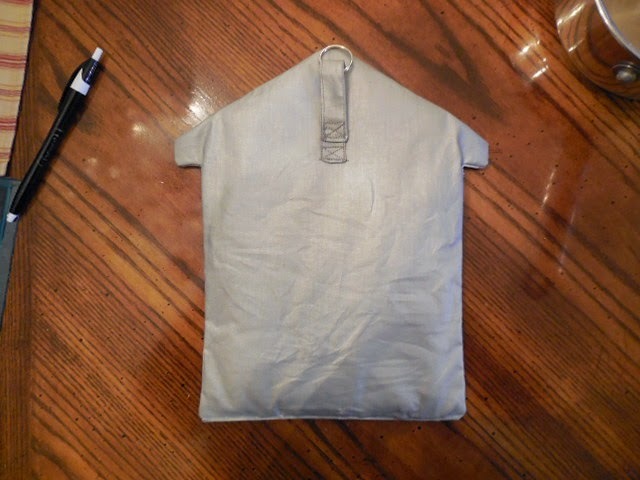 My dad asked me to make one on the fly for someone, a few days before Christmas day, and BOOM! 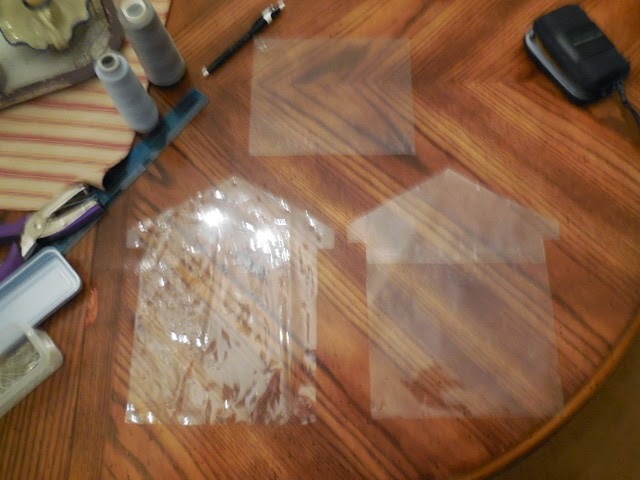 One hour later from him asking me, it was done! 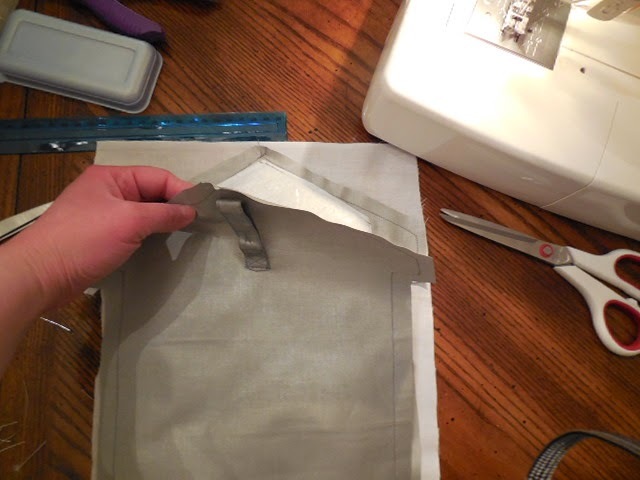 One panel goes under the white cotton, with the 2 pieces of Insul Bright sewn to it, the other is on the back, aluminized silver side facing out, with the hanging loop strip attached to it, so the pot holder can hang. 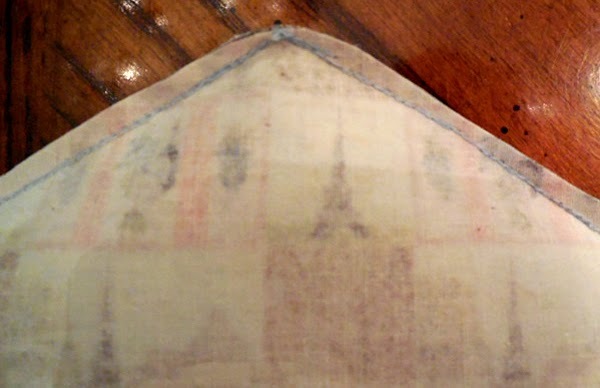 As talked about above, I use 2 pieces insul bright, this really insulates the piece! 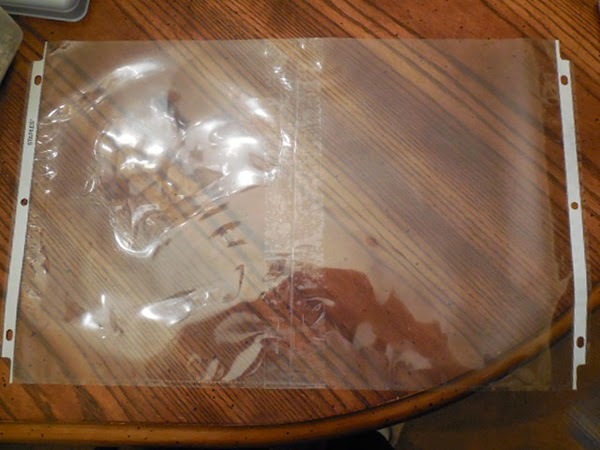 And it is only in the central, main area, that would touch anything that could be hot. 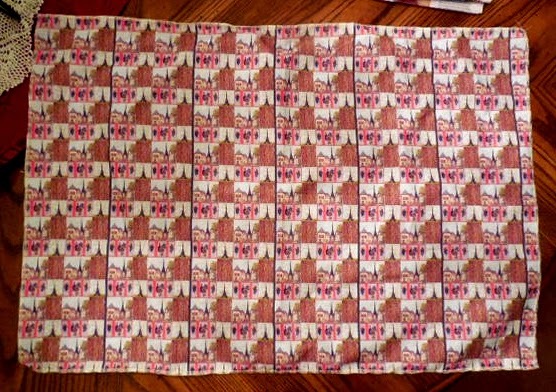 And finally, the Zazzle fabric – you need at least a fat quarter size. 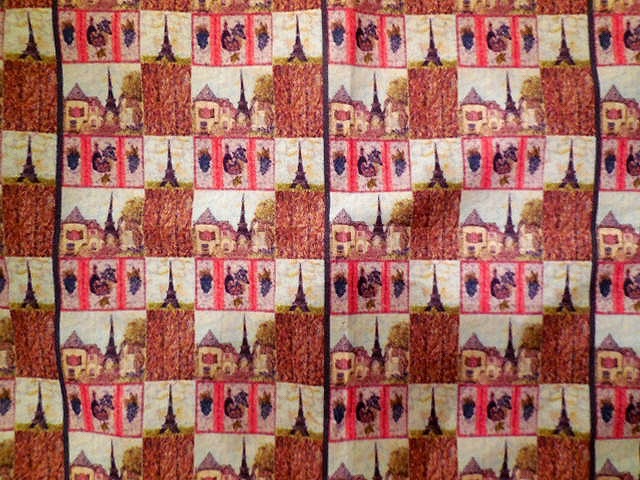 I used their smooth, thicker fibered, combed cotton, which prints nicely, and feels very durable, yet soft. 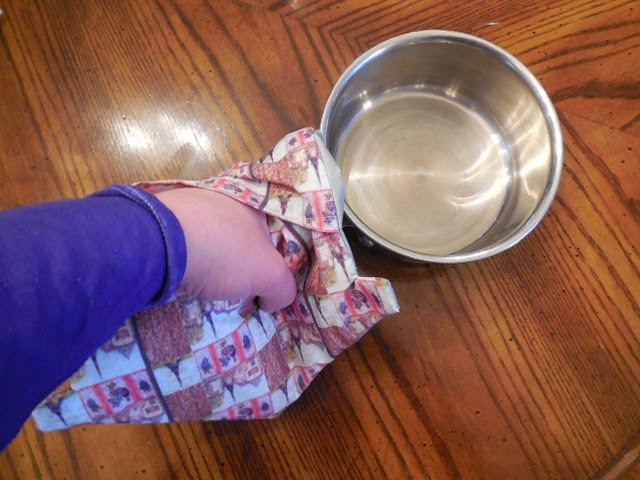 a) For sheet protector(s) transfer patterns – use 1 for 8×10″, use 2 for 9 1/2″ x 11″ – for bigger potholder – lay 2 sheet protectors vertically, but next to each other, side by side, tape seam vertically. 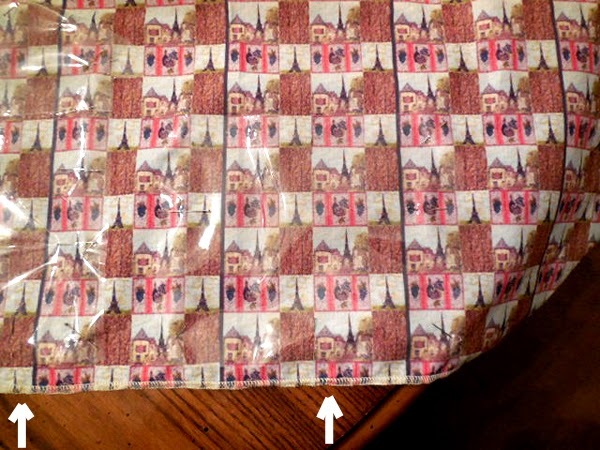 1 – Place the paper pattern under the clear plastic, pin to each other at the top peak of the “roof”, at both sides of the “eaves”, and both bottom corners of the “foundation”, or bottom left and right corner – you can pin in between those pinning points, if you feel the pattern may shift. 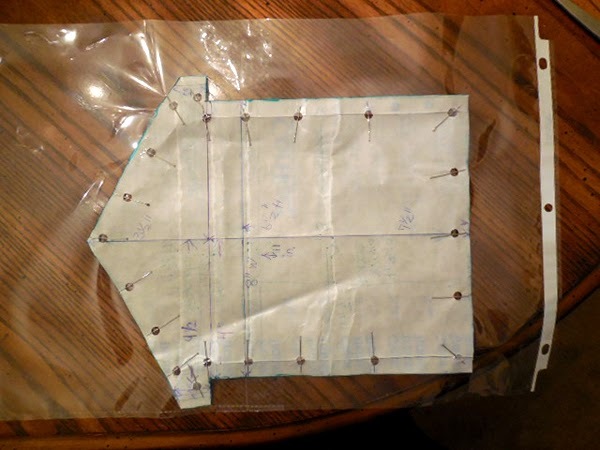 Then either cut around the outline of the pattern carefully, or use a sharpie marker and draw around the pattern outline, use a ruler if necessary, then cut out the clear pattern. 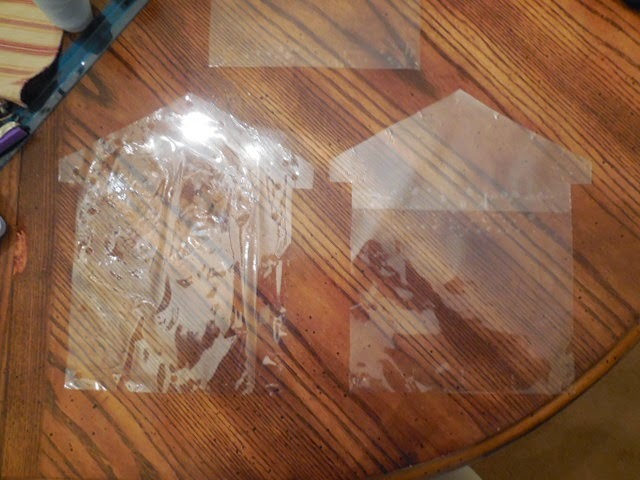 2 – Place cut out paper pattern over the clear plastic, pin patterns in place on top of each other, cut around the outer edges, or use a Sharpie marker, and mark around the edge, then cut out. 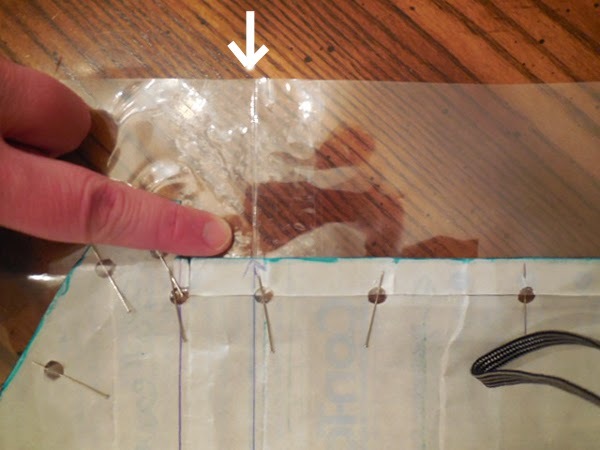 3 – Place the clear pattern over your fabric, to determine what you want to show, making sure that you have 1/2″ seam allowance all around the pattern. 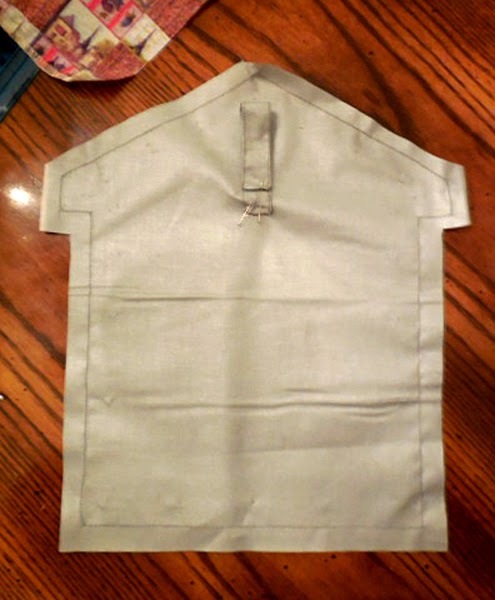 Pin in place over the fabric, and cut around the pattern, leaving the 1/2″ seam allowance around the outer edge. 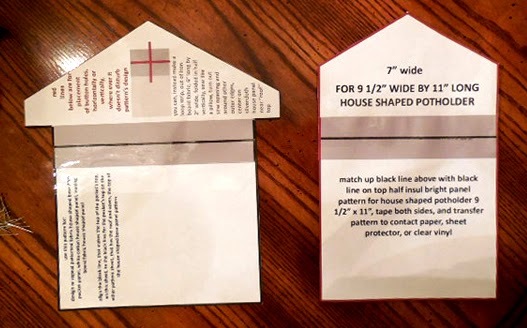 4- For the pocket, if you chose to have one, follow the pattern matching tip in step 2, at the bottom of the 1st paragraph, to find the matching motifs, to align the house shaped base pattern to the pocket’s pattern’s design elements / motifs. 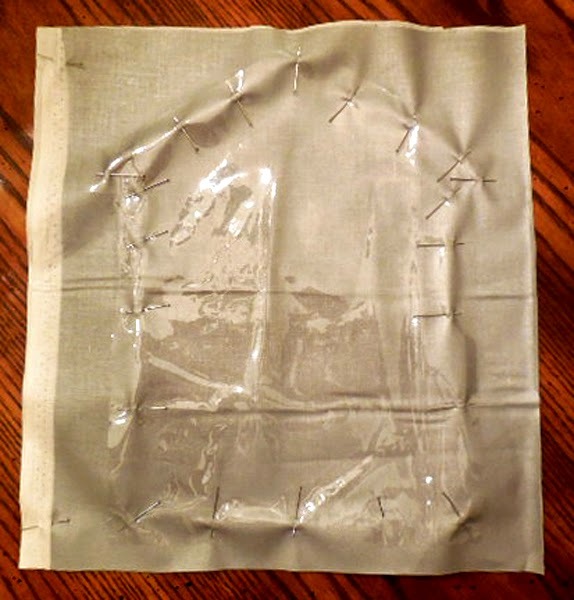 Make a clear pattern version of the pocket pattern, using the guides above, place clear pattern over the area of fabric that would best line up with your house shaped base pattern. 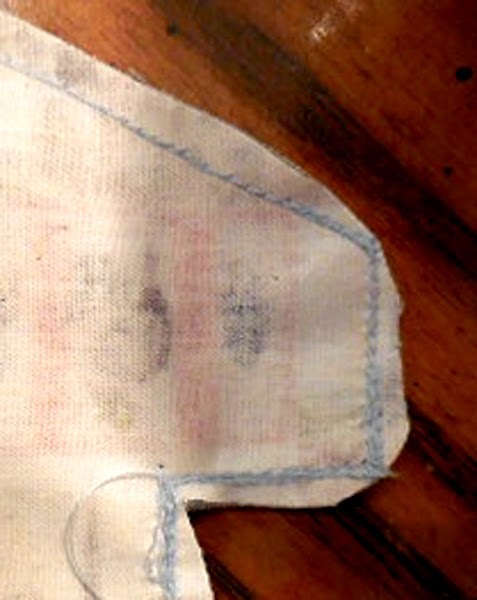 Pin in place all over. 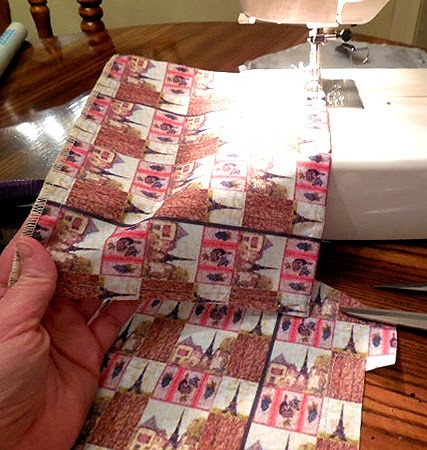 Cut around the pattern, leaving 1/2″ seam allowance on all 4 sides. 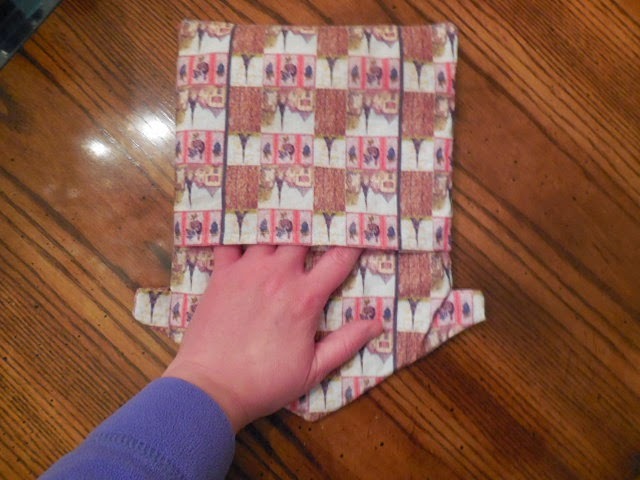 You will fold the top side down twice, pin double folded top edge in place across, and you will sew a hem. 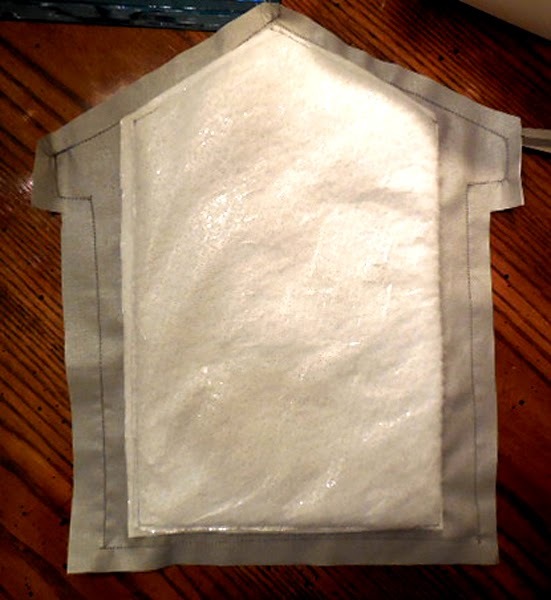 *For pocket, only sew around the 2 vertical sides and bottom, leave the top open from having a stitch edge, because you don’t want any thread to show at the top when folded over, along the edge – TIP: when sewing stitch line, turn fabric pocket panel to where the top is to the left, and eyeball the top of the clear pattern, which is now to the left, and start stitching towards the clear pattern, stop, turn the piece so the top is now on top, and sew down the edge of the pattern’s right side, turn and sew across the bottom, turn and sew down the left, then turn the piece so the top is to the left again, and sew to the edge of the fabric cut edge – this makes guide stitch lines, to use to fold the top down twice, to these guidelines on the side, without leaving a mark on the top of the fold of the top edge. 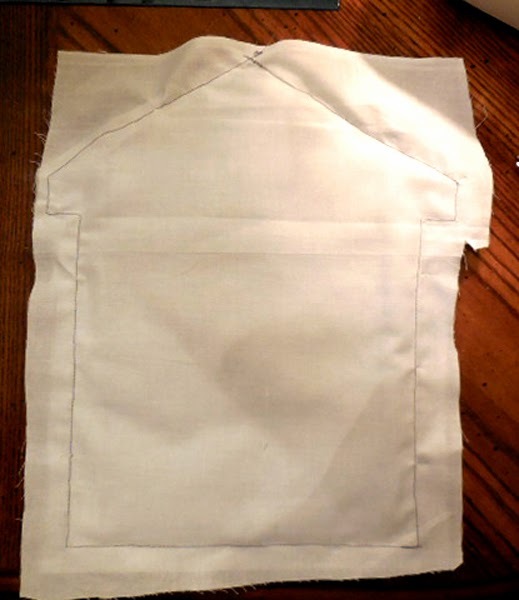 d) Turn the pinned panels so that the bottom edge of the joined panels is at the top, and the roof is towards you – you need to make sure that you leave an OPENING to TURN THE WHOLE PIECE INSIDE OUT FOR LATER. 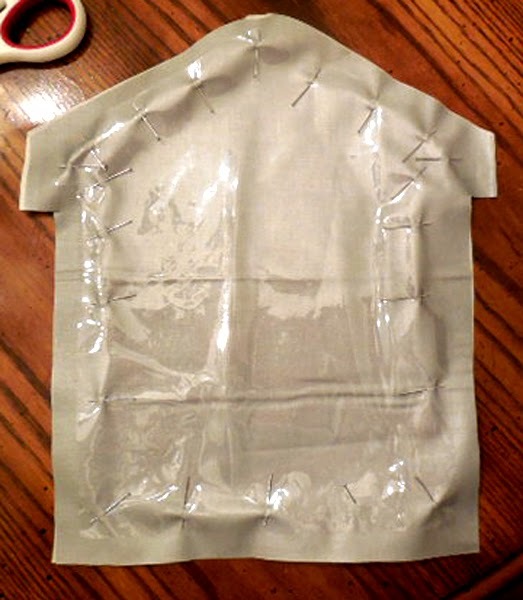 Turn the piece so that the top of the roof is to your left, and start sewing all of the panels together, starting 1-2″ from the bottom left corner, which should be facing to the bottom right at this point, in front of you. 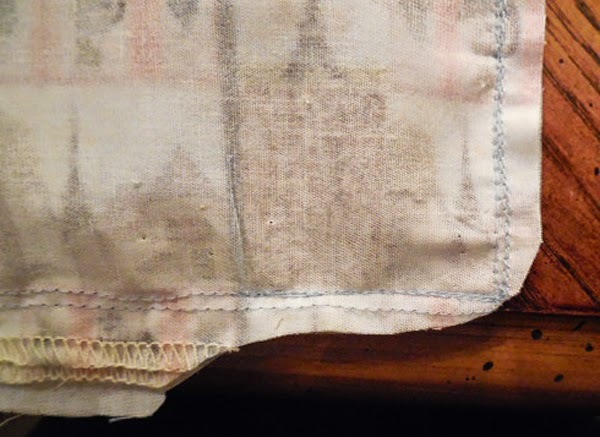 Backstitch at the opening, back stitch at ALL BOTH SIDES of ALL corners. 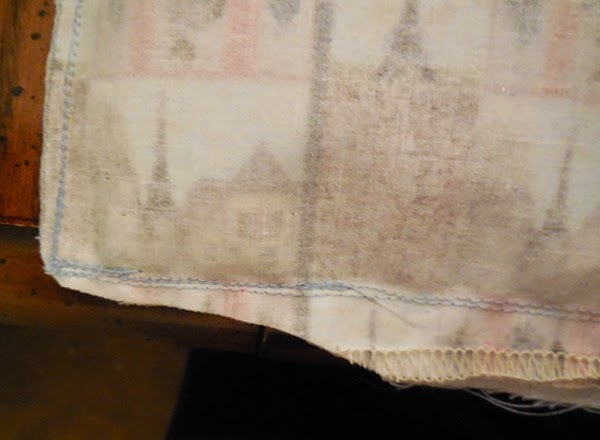 When you get to the bottom edge, which at that point should be facing top right, stop, backstitch at the end, leaving an opening wide enough for your hand to pull the piece inside out. 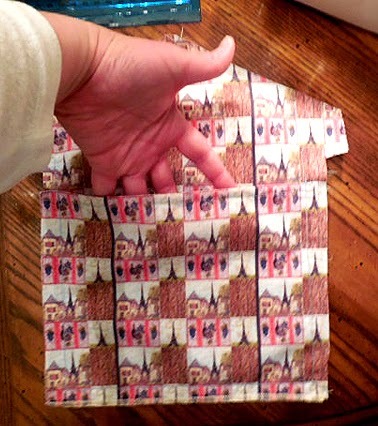 f) Turn the piece inside out, making sure that the seams are pushed out, as much as you can push them. 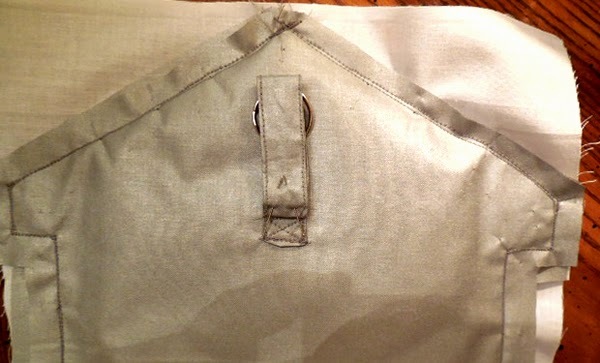 Then tuck in the seam allowances at the bottom, and sew across from one corner edge to the other, to sew the bottom opening shut. 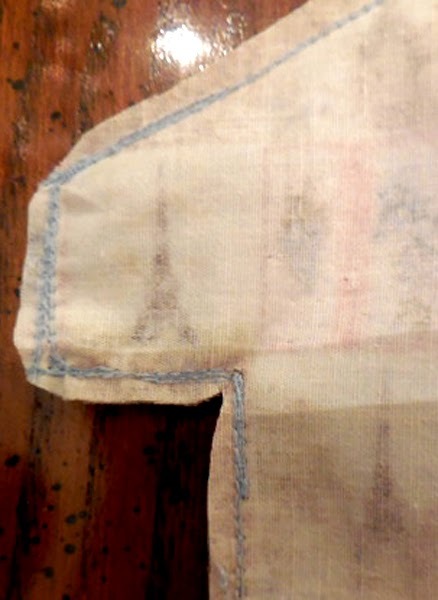 You can pin and iron the edges to help pull all of the seams and corners out, if you want, before sewing the bottom shut.